This dual module has two parallel channels. Output of channel 1 (top) normalized into channel 2 output (bottom). Insert cable into output 1 to break normalization. Can be used as a 2 channel mixer. Malekko VCA is a dual module and has two parallel channels. Output of channel 1 (top) normalized into channel 2 output (bottom). Insert cable into output 1 to break normalization. Can be used as a 2 channel mixer. 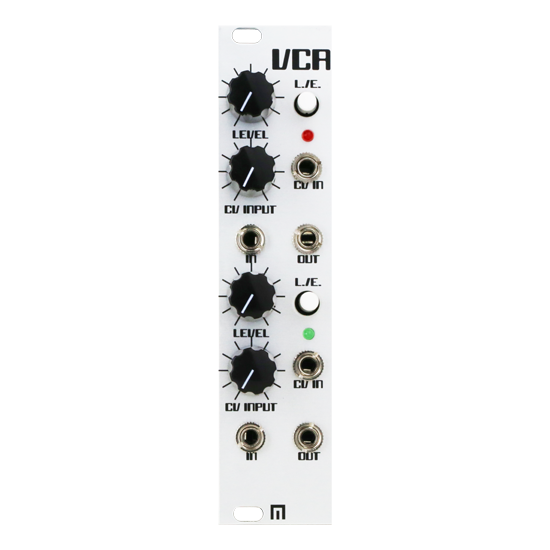 The VCA is 6hp wide, 15mm deep, and draws approximately 60mA of power.